Moles are dark colored marks present on the skin. These pigment concentrations have interesting significance in Indian and Chinese astrology. They are considered important in predicting the future of a person. These are clues of your destiny which reflect your destiny which emerge as a result of planetary positions and signs in your life. The interpretation of moles depends upon their shape, size and color along with their placement on the body. Red, homey and green colored moles are considered good and black moles are believed to bring bad results. For a mole to produce some effect, it should be considerably big in size. Long moles also bring good fortune. Square shaped moles may bring bad luck in the start but will bring good fortune later. Zigzag shaped moles come with bad results. Triangle shapes moles bring a mixed result. Moles on the head can only be seen on a shaven head. Right Side: Makes a person excellent in politics. Red or green color predicts him to be a minister or enjoy a presidential position in a business organization. Ensures success and status. Left Side: Makes a person highly spiritual with special inclination towards literature. He will not have enough money and would enjoy good name in society. A wide and clean forehead is considered good. Right Side: Mole on right side makes a person wealthy and famous in society. He will be a devotee of God and will have a helpful nature. Left Side: Mole of left side of a narrow forehead makes a person selfish and self-centered. He will not enjoy respect from society. Right Side: The mole predicts an early marriage and a good-looking spouse. He may experience sudden arrival of money. Left Side: Also denotes sudden marriage and unexpected wealth but with loss in business. Center: Mole on the middle makes a person a great leader with lots of wealth, name and fame. He enjoys luxuries in life. Right Side: Predicts an early marriage and a wonderful spouse. The luck becomes stronger after marriage. Left Side: Predicts bad luck for the person as he faces problems in job and business. He is not able to use and utilize his money. Right Eye Lid: Mole on right lid brings money. There is a slow arrival of money. He will spend lots of money on God and religious activities. He will enjoy inner pride and satisfaction. Left Eye Lid: Predicts low earnings and feeling of jealousy from others. He lives a regular life. Right Eye: Promises strong luck and easy flow of money, even without putting in hard work. Left Eye: Makes a person arrogant. He gets involves in illegitimate relationships. 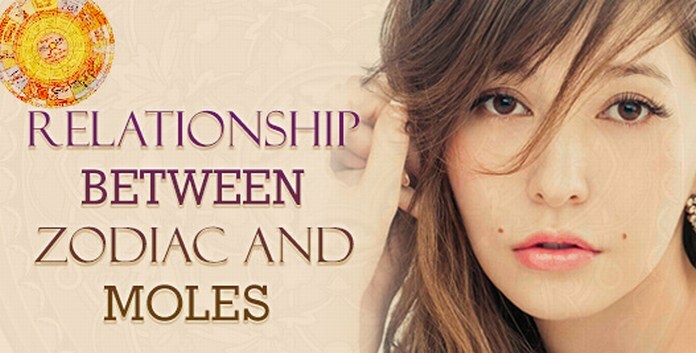 Corner towards the ear: Mole on the socket makes a person peace-loving and generous. But there are chances that he may have a sudden death. Corner towards the nose bridge: Predicts intense grief for the person due to untimely demise of the children. 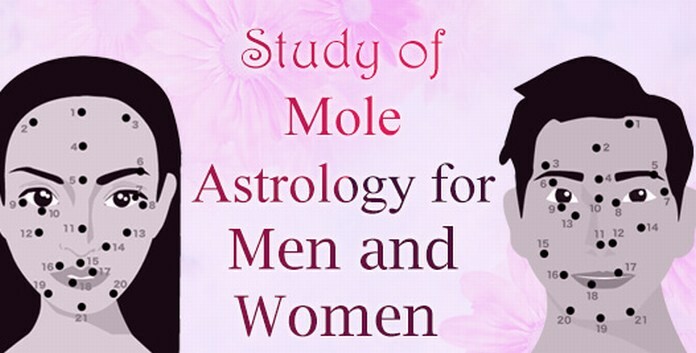 Presence of mole anywhere on the ear predicts a life full of great earnings and luxuries. There will be a balance in expenses. It predicts a smooth and easy life with a danger of drowning. Tip: Mole on the tip makes a person short-tempered. He will have high self-respect and will be respected by others as well. Right Side: It predicts smooth and easy flow of money. Left Side: This mole doesn’t predict a good life. The native may get involved in prostitution. Bridge: It represents a life full of challenges. Native may face difficulty in finding a job along with loss of money. Below Nose: Promises a large family with many children. Middle: A mole exactly in the middle of the chin predicts a lofty person who enjoys laurels in society. Right Side: This mole makes a great diplomat with logical thinking abilities. He can convince and negotiate others with his great communication abilities. It brings along name, fame and money. Left Side: This makes the native a straightforward person. He may not be liked by people and may get involved into frequent fights. Expenses will be more than earnings. Upper Lip: A mole on the upper lip predicts the person who loves luxuries. He loves to do good to anyone and everyone. Lower Lip: This makes the native a food lover. He also enjoys theatre arts and acting. 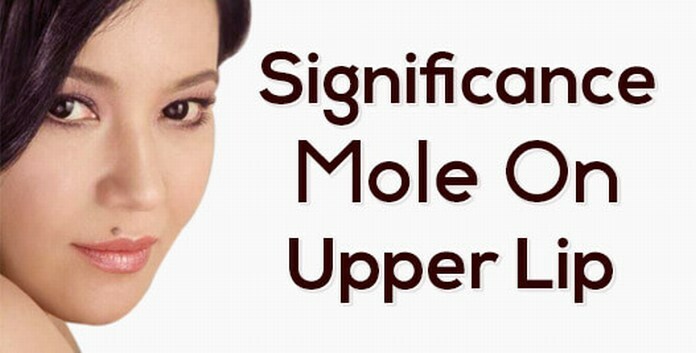 Inner Side of the Upper Lip: This mole makes a person skilled in mystic forces and mantras. Inner Side of the Lower Lip: It represents a person to be a drunkard. He will lose money on speculation. Right Cheek: The mole predicts a person who is very sensitive and respects his parents. He loves his spouse and relatives. He enjoys a happy life. He lives long and dies as a wealthy man. Left Cheek: This mole makes a person arrogant and introvert. He will have a difficult life but he will enjoy his old age because of his family and children. Center: This mole predicts problems in education. The person may have health issues and will face problems in speaking with fluency. Tip of Outer Edge: Makes a person a great speak with the power to convince others. He enjoys good food. He adores his kids and enjoys a happy life. Back of Neck: It makes a person very aggressive and angry. He participates in anti-social activities. Front of Neck: This mole promises a sweet voice. The person will be artistic and will settle nicely after marriage. Right Shoulder: Moles on right shoulder make a person courageous and brave. He is very particular about finishing his work. Left Shoulder: This mole involves the native in fights. Right Side: This mole indicates financial problems in life. He receives respect and honor from people. Left Side: It makes the person clever. He doesn’t enjoy cordial relationships with his friends and relatives. He will face financial problems. Middle of Chest: A mole on the middle indicates intense financial problems. He may fall into heavy debts. He is a devotee of God. Right Armpit: A mole here indicates desire for wealth. Left Armpit: This makes a man long for women. Right Side: This mole makes a person with inner fears. He will be an easy liar. Left Side: This represents average earnings. Right Side: A mole on the right side of stomach represents good earnings for the person. Left Side: It represents a jealous person. He likes to earn easy money. He will be an owner of an agriculture lands. Near Navel: It represents luxurious life. He may be a loud-mouthed person. Right Hand: This mole is an indication of a smart person with the ability to finish any work with tenacity and intelligent. Left hand: It indicates a person who longs to earn money but stay grounded. Right Elbow: This mole indicates lots of wealth and success. The native has interest in fine arts. He is helpful and also receives help from others. Wrist: It indicates a financially difficult childhood. The person becomes a painter or writer. He will enjoy great earnings as he will age. Moles anywhere on the inner side of the palm are not considered good. They indicate difficult times. Moles on fingers are not good. They are reflection of tough times in life. Near Backbone: This mole is an indication of name and fame in life. Such a person becomes a minister or leader. Right Side: It is an indication of great courage and good health. Left Side: This mole reflects getting the tasks accomplished with diplomacy and tactics. Right Buttock: This mole makes a person wise and innovative. He may become an artist or art lover. Left Buttock: This mole is an indication of poverty. The person leads a deprived and strenuous life. Right Thigh: This mole indicates a courageous person. He will have abroad visits. He may enjoy great benefits from a special lady in his life. Left Thigh: This mole reflects few friends. The person will be highly skilled in an art form. He will also be lazy and dull. Right Calf: This mole is an indication of a successful life. The native may become a great politician. Left Calf: It indicates lots of friends. The person will enjoy lots of travelling due to work. Right Ankle: The person with a mole on right ankle will b highly devoted towards God. He will possess the power to foresee the future. Left Ankle: The person may face some legal issues in life. He will always talk less. Right Foot: This mole indicates a happy family life and a wonderful spouse. The person will be a devotee of God. Left Foot: The person will face financial problems in life. He will also face troubles in marital life. Bottom of Foot: This indicates that person will enjoy lots of travelling. He will have a licentious nature. He will love fine arts. He will have lots of enemies. 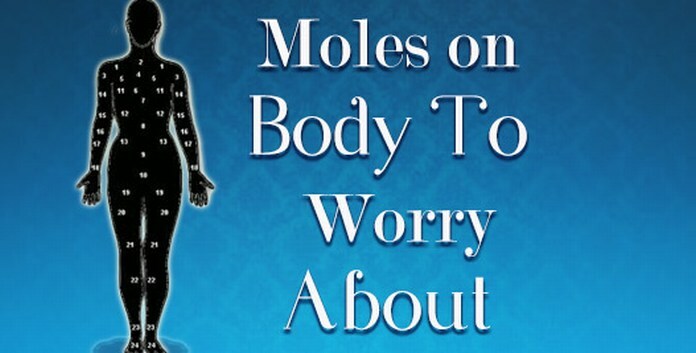 These are the clues which are reflected by every mole present on your body. Now you can predict your future by reading these interpretations. I have 3 moles on the under my lift eye.one is on my lower lift eye led there’s a nother 1 and a hafe in down from it and the last one is about the same but in line with the lowest one like and up side down pearmed. What does that mean? I have 3 moles on my neck dead in the center at front of neck which makes a triangle and I have the same but on my right temple but tilted abit what does these two mean ??? Hi, I have 2 moles on my left side of my nose and one on my left cheek, I have 2moles on right feet, and 1 on left feet…so funny what will be ur prediction for my moles in nose and foot…..
I’m having moles on my right toe 3rd, and on right shoulder what is my future predictions?? i have a mole in upper lips right side. one mole in right hand below wrist.